Arum listed a few other possibilities, including Lucas Matthysse (if Matthysse either beats Manny Pacquiao next month or if, as Arum feels could be the case, the fight between Matthysse and Manny Pacquiao doesn’t come off – Arum is sceptical over the funding for the scheduled Kuala Lumper fight) – but the Khan possibility stands out. Okay, most fans will instantly shoot down the fight, claiming it has next to no competitive value, that there is only one winner: Crawford. But Khan, with his sheer speed, of hand mostly, might just give the pound-for-pound star a few problems; at least for a few rounds. Yes, eventually, the thinking is, Crawford would begin to hit the target more and more regularly and Khan’s mandible would again let him down. But has Crawford ever met a faster fighter before in his career (Yuriorkis Gamboa perhaps)? “Amir Khan could be a possibility, I have to talk to him. He’s a free agent if he fights in the US,” Arum said. It would be interesting to see what Khan thinks about this huge possibility, and what Eddie Hearn, with whom the former 140 pound champ has recently signed up with, thinks about it. 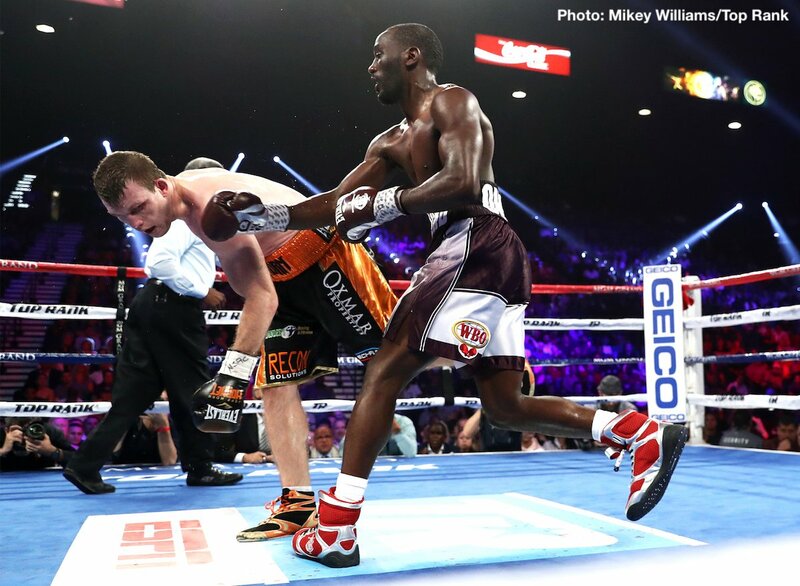 Maybe Khan – a man who has never looked to duck and dodge the big, big fights – will find the idea of fighting Crawford a whole lot more appealing than finally taking that big domestic grudge-match with Kell Brook. It’s probably just a small notion in Arum’s mind and not too much more, but judging by the fan comments I’ve read there is interest in a Crawford-Khan fight. And just imagine, if you can, what a stunner it would be, how enormous it would be, if Khan somehow pulled off a win! Next boxing news: Gennady Golovkin opens as a significant betting favourite to beat Canelo Alvarez – but who will you be rooting for?